Size: 791 sq.ft. - 1907 sq.ft. Emaar Properties has been offering master developments with beautiful surroundings since the begging to till date. This time the group is building a mixed use tower having a height of 300 Meter (approx) with the wide logo of EMAAR at the top. It is an excellent combination of Residential apartments, Podium townhouses and penthouses. Emaar group is glad to introduce this new launch in the most impressive area of Dubai known as Dubai Creek Harbour. Dubai Creek Harbour is an Island District formerly known as The Lagoons. The Grand apartments are available with impressive enriching offerings like shopping and retail facilities, world class residences, business and offices and more. These homes are available at very attractive negotiable prices starting from AED 1,170,000 with an easy installments payment plan. The project residences will be ready to occupy in 2021. Emaar Group is putting 100% effort to fulfil huge demands of End users and investors. Dubai Creek Harbour is a master planned development having waterfront views where all the development is concentrated on the Island District. The developer is very pleasant to announce The Grand development on this Lagoon. The Grand tower is providing numerous options to its buyers/investors to pick from: - spacious 1 BR, 2 BR and 3 BR apartments. Apart from BR apartments the building holds few units of 4 BR Penthouses and townhouses. 1 Bed to 4 Bed apartments size ranges from 792 sq.ft to 3193 sq.ft. This project is a unique combo of creativity that describes the future of living and adds more values to this wonderful metropolis by introducing itself as a 62 floors skyscraper, 56 storey will cover residential apartments only and the rest floors are dedicated to townhouses and podium penthouses. The skyscraper consists of 500 units that faced towards the waterfront. Emaar group was introduced in the year 1997 on June 23 by Mr. Mohamed Ali Rashed Al-Abbar. Emaar Group is headquartered in Dubai, United Arab Emirates. Emaar Properties is a Public Joint Stock Company listed on the Dubai Financial Market. Emaar Properties is associated with other high class projects in Dubai that includes Dubai Marina Mall Complex, Panorama at The Views, Travo, Al Murad Towers, Mosela, Burj Khalifa, Il Primo, Emaar Business Park Building 3, Address Boulevard, The Lofts, Boulevard Central, Zanzebeel 3, Miska 5, Reehan 8 and Creekside View. Almost 37,350 residential units were handed over by Emaar in Dubai. Today Emaar generates the revenue over AED 4.383 billion by developing Shopping Mall, Retail, Hospitality, International Operations and Leisure Subsidiaries. The Grand 62 storey Tower stands on the Island District of Dubai Creek Harbour. 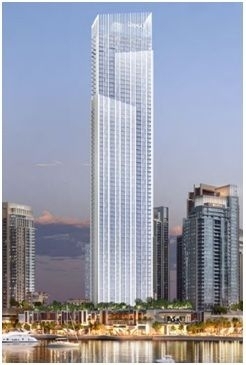 The apartments will be facing Downtown/Burj Khalifa. The Island District is a new harbour district by Emaar & Dubai holdings. The address of "The Grand" apartments is a mixture of Boardwalk, Boulevard and Corniche lifestyle with themes of Dubai Marina & Downtown Dubai. "Dubai Creek Harbour" is also the future address of world's tallest tower and the biggest mall in the world. It is a just few minutes drive from the key destinations in the emirate including Business Bay and Dubai International Airport. Dubai Creek Harbour (DCH) lies at the heart of a new vision for Dubai where the Island Park is being constructed. The project location is just a 10 Minutes drive from downtown Dubai. DCH is also the site of The Tower which will be the tallest building in Dubai which is expected to complete in 2021. The Grand project is located at Dubai Creek Harbour (DCH), complex of apartments in Dubai, United Arab Emirates.